The Tesla Roadster is, as you may already know, an all-electric sports car developed by Tesla Motors. The initial prototype has been revealed at first in 2006, and two years later the Tesla Roadster has been launched on the automotive market as an all-electric limited-production sports car. Although it had its drawbacks, the Tesla Roadster is a unique specimen and so it managed to get the attention of many gearheads around the world. Now however, Tesla Roadster has announced the 2012 model which promises to improve upon the earlier model and weed out some of the problems. What makes the Tesla Roadster 2012 tick are no more or less than 6,831 lithium-ion cells which are able to develop the equivalent of 302 horsepower and 273 lb-ft of torque. The entire package enables the Roadster to reach top speeds of 125 mph and an acceleration time from 0 to 60 in just 3.9 seconds. 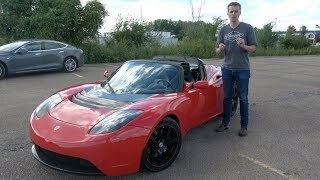 Furthermore, the 2012 Tesla Roadster has received some modifications in terms of electric motor and inverter systems in order for the car to perform better on ice. 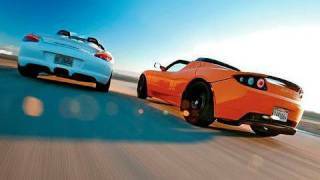 As with the previous model, the 2012 Tesla Roadster is built around the chassis of a Lotus Elise so it shares some similarities with the Lotus at first glance, but the resemblances lie mostly in design and in the fact that both of the cars are two-seaters. In fact, as similar as the Tesla Roadster looks compared to the Lotus Elise, the Tesla Roadster shares merely 7% of its components with the lotus. The Tesla Roadster 2012 body is built entirely out of carbon fiber and overall, it really doesn’t look like what you would imagine an all-electric car to look like. It actually looks like a thoroughbred sports car. The 2012 model has been refined on the exterior, both the front fascia and the rear diffuser being redesigned. Other significant features include a set of Xenon headlamps and the enhanced front windscreen seals which are now able to keep the cabin quieter. On the interior, the 2012 Tesla Roadster base model features power windows and locks, cruise control, new seats offering increased support and comfort and a new air conditioning that has been tampered with in order to be more efficient. Other optional extras include premium leather upholstery, a 7-inch touchscreen display featuring backup camera, microfiber seats and a carbon fiber hardtop. As for the range, you can expect the Tesla Roadster 2012 to go for about 245 miles before you’ll need to charge its batteries again, and in case you’re wondering, a full charge takes about 8 hours with the standard charger, 3.5 hours with the $3,000 high-speed charger and 45 minutes with a commercial-grade electrical connection. As for reliability, Tesla engineers claim that after 100,000 miles, the batteries will still be able to retain 80% of their capacity. Last but certainly not least, the pricing and availability. The Tesla Roadster 2012 is to be sold at roughly $100,000 only in Europe, Asia and Australia.